The word "palisades" is used to describe a line of high, steep cliffs commonly seen along a river. The Mississippi Palisades State park hiking trails give you an opportunity to walk where the Native Americans walked, nearly 1,000 years ago. The 2,500-acre Mississippi Palisades is home to numerous varieties of birds, including wild turkeys, woodpeckers, and in January and February be sure to come out and view the majestic Bald Eagles . White-tailed deer, muskrat, and occasionally badgers can be seen in the park as well. The best way to see the beauty of the park is by hiking its trails. There are five trails in the northern section of the park, and five in the southern section. The northern trails are wider and easier going than those in the south. The trails in the south are narrow and close to the bluff. If you are not a hiker, just be sure to take a drive through the park and stop at one of the scenic overlooks. Indian Head and Twin Sisters rock formations on the bluff tops can be seen from the highway along the Mississippi River. The Palisades offers over 200 campsites, with some electrical hookups available. A convenience store is located near the North entrance across Route 84 from Millers Hollow boat launch facility. 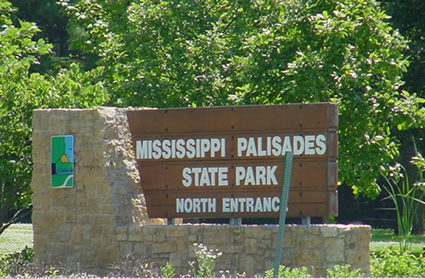 The store in the Mississippi Palisades State Park is open only during the summer. Picnic tables are scattered throughout the park, with toilet and play facilities conveniently located nearby.